I came to the conclusion this week that I’m deeply tired of that pause from the pleasure of eating out that’s inescapable when the let-me-get-a-shot-of-that-before-you-take-a-bite routine kicks in. So I plan to give it a bit of a break. While at the same time giving a break to family and friends who usually love, but surely sometimes are perplexed by, hanging out with a food professional. Of course I’ll still be taking food snaps, no way around that. They’re part of the toolkit of food professionals. My recipe-testing archive for any development project includes photos of tests, valuable cues to illustrate the recipe results for future reference and comparison to other tests. And in restaurants, the occasional “wow, haven’t seen that before, gotta remember this idea.” Oh, and how could I forget, those occasional social-media shares, the ephemeral shots that are shared once and not thought of much more. I came up with plenty of fun and interesting shots, no problem there. Salmon fishing in Alaska and crabbing off Lummi Island, gorgeous berries at an Oregon farmers market and just-foraged white chanterelles still in the mossy fluff of the Cascade foothills. Clams being steamed on a camp stove on the shore of Hood Canal and a selection of local hard ciders on Vancouver Island. When it came to perusing the what seem to be thousands of shots from a mishmash of restaurant meals over the years to illustrate the local restaurant experience, I was wildly underwhelmed. Out of context a month or ten later, they hold no more meaning. They’re just clutter in my photo files, the burden of another day’s editing process, rather than substantive value of some kind. Where was I? What was this dish again? Why did I take this shot? So after my eyes had glazed over from that plate-shot overload, I found myself gravitating instead toward view shots I’ve become inclined to take while out and about. Maybe it doesn’t show the braised short ribs with pickled sour cherries or house-cured guanciale with shaved fennel or wood-oven-roasted smelt. But it seemed to serve a couple other purposes instead. We lose perspective any time we get confined by a self-imposed bubble around us. Looking up from the table, around at our table mates and surroundings, out the window to the greater context of that moment in time–it helps appreciate the greater value of the experience. The food is fleeting by design, intended to be enjoyed then and fully. But not memorialized for all time. Plus, hell, we live in one of the most glorious cities on earth. It’s unique and distinctive and has a personality all its own. Do you think this city’s food scene could be replicated anywhere else? I sure don’t. Capturing the image of not just what’s about to be on my fork but of the environment in which I’m lucky enough to be eating–to me it tells as important a story as any about what it means to eat well in the Northwest. One of the quintessential shots, Ray’s Boathouse. 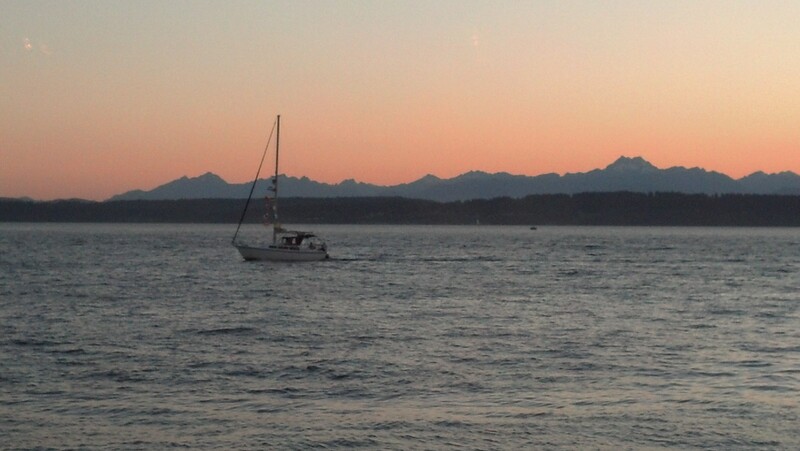 Olympic Mountains in the distance, a lone sailboat en route to the Locks. You recognize this view, right? 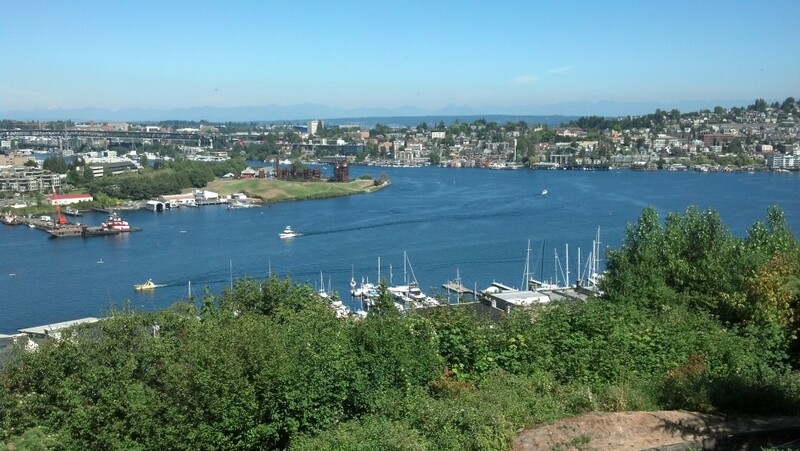 Lake Union, Gasworks Park, I-5 bridge, Cascades in the distance. If not, get to Canlis soon. Opened in 1950, it remains one of the city’s most distinctive and delightful restaurants. In my ‘hood — looking back on the city’s skyline from West Seattle provides one of the most impressive perspectives on the city. 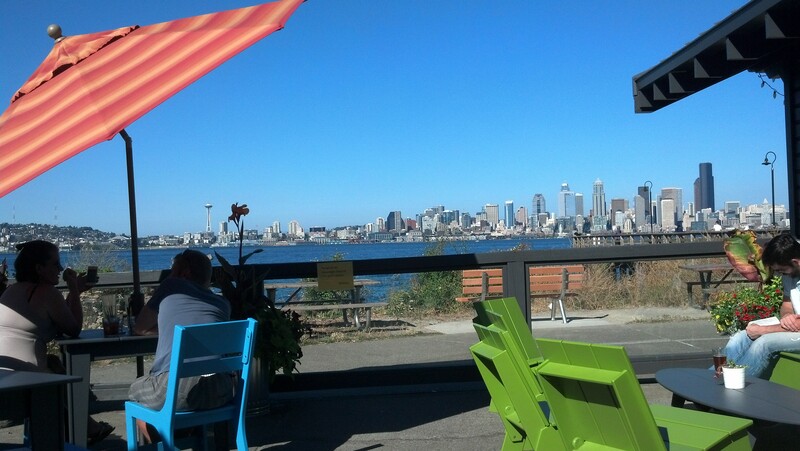 The beer and tacos at Marination Ma Kai are worth a visit regardless. Yeah, it’s another sunset view of the Olympic Mountains. But to me there are few things that stir my soul more. 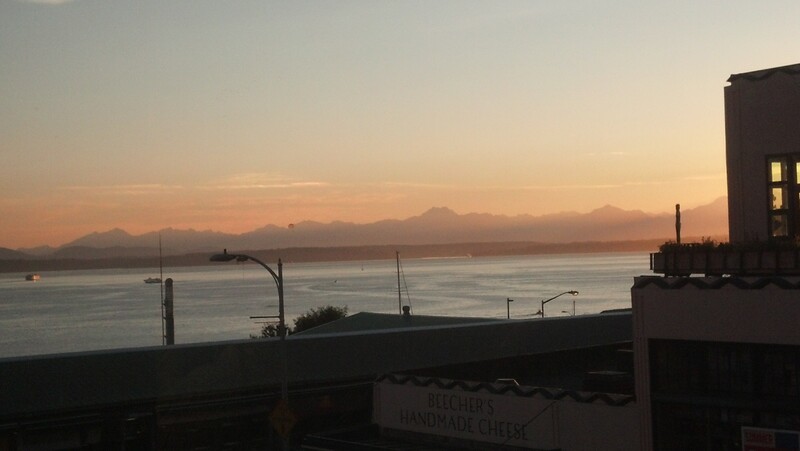 This from the lively and delicious Steelhead Diner in the Pike Place Market, with a glimpse of Beecher’s Cheese below. I have a lot of food pictures, too. You’re right; they’re not the be all and end all. A few are stunning. And most are…food. I love your views! I’m trying to get more candid, offbeat restaurant shots… of cooks, servers, sometimes other diners.